Most economists expect businesses to exploit advantages they have in typical factors of production like land, labour, capital, intellectual property or communications. If a business owner has some advantages in one or more of these then classical economics indicates that there may be room for a profitable business. My experiences with small business owners show that as well as these traditional factors, there is a suite of ‘soft’ factors which are much more important in getting a viable business up and running. I’ve called them the “4 M’s”. Working with councils and other groups keen to see businesses flourish, I get to see a lot of ‘great ideas’ proposed by well-meaning community leaders. They can see what they assume to be a variety of great business ideas which, if turned into reality, would add to the diversity of the local business mix and, they are quite sure, yield a profitable business for the person who starts it up. But whenever an outsider identifies what they think is a great business idea, a gap in the market or an untapped opportunity, it is always up to someone else to take the risk, make the investment in time and money and have a go. There’s a long way to go from idea to viable business reality, and there are 4 crucial steps. So how does this ‘great idea’ stack up against the 4 M’s? Motivation: Is the person best placed to take up the opportunity likely to be motivated? Without some drive and passion there is no way anyone will bother to take the risks in investing time and capital to exploit the good idea. What other income and business options does the best-placed person have? Is there room in their life to wade into a new enterprise? And are there good enough reasons and motivations to do so? Margin: Is there likely to be a real profit margin in the business? The idea may look great to an outsider, but will a rough estimate of costs in getting sales vs sales expected show that there is a margin to be made? We have a great 4 step (highly condensed) ‘barefoot business plan’ which goes a little beyond the ‘back of the envelope’ but it still simple and practical and which determines if there is any money to be made. Market: Is there actually a market for the great idea, and can the person best placed to take it access the market? This is particularly important in regional areas if the great idea involves selling to people a long way away. How strong is the supply chain? How good are the networks and relationships that will be crucial to getting the product or service to customers? Mentoring: How well suited to business is the person best placed to take up the great idea? Are they familiar with the nature of business intended, and do they have a good basis in the product or service, and contacts in the marketplace? Almost all start-ups gain great benefit from the experience of others, and the mentoring process is a powerful way of mitigating the main risks that start-ups may fail – lack of experience and business acumen. Mentoring can be a formal process, or an informal relationship. This too is a particular issue in regional and remote areas where there may not be many ‘tracks in the sand’ ahead, or people around who have had a successful venture. These form a natural sequence – but each needs to be ticked off as they are in fact a strongly linked chain. If any of the links is weak – if any one of the 4 M’s is weak – then the great idea will not be turned into a viable business. Is it a good business – or is it just a good idea? This is a very easy to follow and highly simplified 4-step way of assessing the financial viability of a ‘great business idea’. It looks for a cash profit – income exceeding expenses. It does not include depreciation. Nor does it include paying tax – through if you make a profit in your first few months then you should be very pleased to have made it to the stage of having a tax obligation! 1. What will you sell? All businesses sell something – their product. Products can be either goods or services. For example, many businesses such as farmers, artists, shops and factories sell goods like food, clothes, paintings, books or cars, which customers buy and take away. Some sell land or houses which you don’t take away – but the product is still an item of goods which you come to own after you buy it. Other businesses sell their customers services. Hairdressers, travel agents, cinemas, painters and babysitters are businesses like this. They charge either by the service, or by the day, hour, etc. For example, hairdressers charge you for the haircut, but babysitters usually charge by the hour. 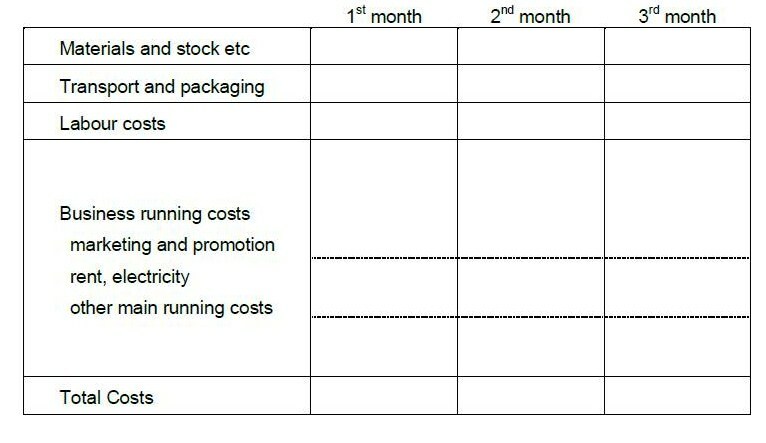 Describe your main product as an item of goods or a service, and indicate how you will charge for it in the following table. Whether it is a service or an item of goods, producing what you sell is only part of the job of running your own business. You also need to find customers and convince them to buy your product. • Where are the customers? Are they living in your local area or will have to travel to reach them? • Who are they? Are they shopkeepers, family members, neighbours, community people, tradespeople, shoppers, or tourists? • How will you convince them to buy your product? How will you reach them? Will you have to knock on their doors and convince them in person? Will they recommend your business? Are you the sort of person who will enjoy the challenge of this side of your business? Write down the number of sales you can realistically expect to make each month while you get going. Make sure you can really reach enough buyers to make these sales! 3. Who else is selling? Your business will have competitors. Their products may not be exactly the same, but you will be competing for the same customers. Think about which businesses you will have to compete with, both locally and further away. 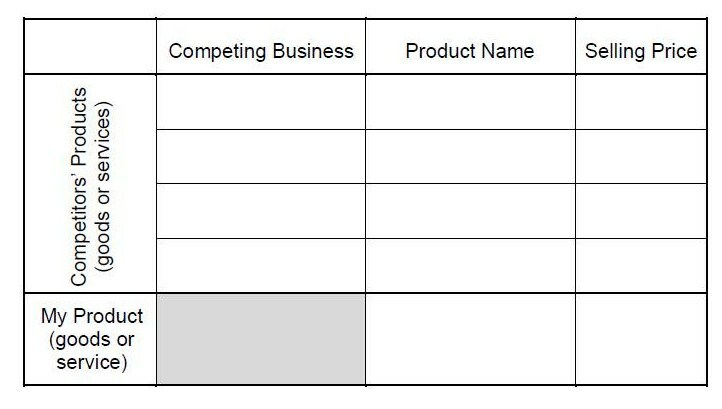 Now list competing businesses and their product names in the following table, and write their selling prices in too. What is the going price for items or services like yours? Write in the selling price you intend to charge for your product. Remember if it is too expensive, people will buy from your competitors. But if it is too cheap, your business won’t survive. 4. What will it cost you? If your goods or services cost you too much to produce, then you shouldn’t be in this business. You should be making enough money on each sale to pay for all your business and production costs  and pay yourself a wage! 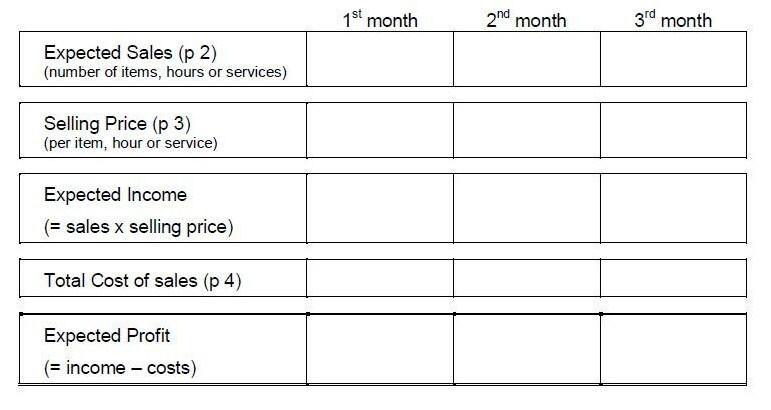 Using the table below, for each of the first three months fill in the cost of the materials you will need, transport (including your own petrol), labour if you have to employ somebody else, and some of the main business running costs. Add these costs up to get the Total Costs. 5. How much will you make out of it? Now you can use the number of sales you expected each month in Part 2 and the selling price you used Part 3 to work out if you will make any money. First, in the table below write in the numbers you worked out on Parts 2, 3 and 4. Your Expected Income is the Expected Sales times the Selling Price. You can work out the Expected Profit each month by taking away the Total Cost from the Expected Income. There will be other costs you will have to cover with this profit – things like car registration, stationery, telephone bills and any loans you might need to repaying. You will also have to pay tax on the money you get. But for now, this profit figure will be a rough guide. Think about this profit and the amount of work you will need to do for each item you produce, or service you deliver. Remember that you will probably have to give up your current income (give up your wages or give up your social security) and have to work longer hours than in a normal job. Will you be able to pay yourself anything from the profit? Do you think this pay is enough for you? • Can you see a way of selling more each month? • Could you cut your costs? • Could you increase your prices? If you can’t see a way of getting the pay you need, you may be better off starting your business as a hobby, getting better at it and looking at turning it into a business later on. This entry was posted in Business feasibility; business planning, Economic development, Uncategorized and tagged 4 Ms, business feasibility, business planning, entrepreneurship, local business, small business on August 28, 2015 by kimhoughton.